From the August 2017 school start until the middle of September, Christian Radich is available for new school tours. Tours for the years 2018 and 2019 can already be reserved from May to June and from mid August to September. Prices are from 1350 NOK per trainee per day. Tours shorter than 3 days cost 1500 NOK per trainee per day. All meals are included. Pocket money is not required. 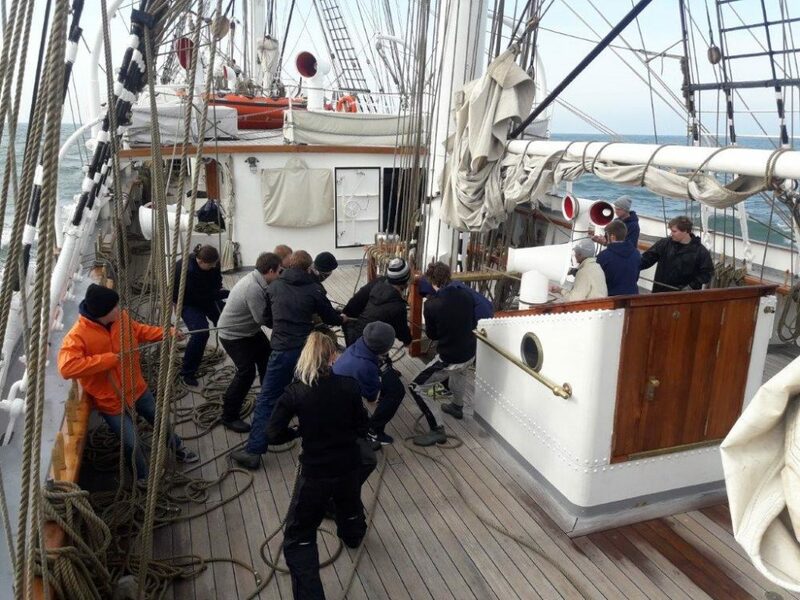 Both students and adults will learn seamanship, cooperation and unity in a unique environment. All meals are included and the gallery is known for providing an amazing culinary experience! We have a small shop on board which sells both snacks and souvenirs, so if you choose to bring a small amount of spending money, it won’t go to waste. If you choose Christian Radich for your school trip, the students will both challenge themselves and get to know their friends on a whole new level. Everyone is in a new arena, everyone is equally important, and everyone must participate! After a safety introduction and explanation of life on board, the group is divided into three shifts, each of which are 4 hours on, 8 hours off. Entering the rigging is voluntary, though it is often experienced as a personal victory for many. School tours are primarily for 9th and 10th grades. A typical school tour lasts 3-5 days, and is calculated for a minimum of 2 classes plus guardians (teachers and parents) for a total of a minimum of 60, maximum of 80 trainees. This often means that 2-3 classes combine – something which once more increases the spirit of team work and the overall experience. Unfortunately, Christian Radich is not equipped for handicaps. If you suffer from, for example, epilepsy, diabetes or another condition, we will be required to make an individual assessment of your capabilities on board. Allergies and individual food requirements are not a problem, just be sure to remind us of them prior to departure. We will gladly hold a presentation with a film about class trips for students, teachers, and parents should such be desired. Don’t forget to ask us to send our brochures on school tours!